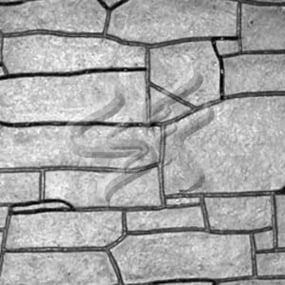 Stone sizes 3" to 24"
Visit our Resources section to download our catalog, application guides, product facts and other technical information. Liners are attached to the form using TEK screws through the face of the liner spaced 12” C-C. Optional form mounting T-nuts embedded through the plywood backing is available for Elastospec panels. Apply with low flow, wide angle, flat spray nozzle and wipe with a cloth to insure a complete even coat to the entire form liner surface. Do not over apply form release agent. Protect treated form liners from precipitation, dust, and debris. Do not apply to reinforcing steel. For best results, use SPEC Release, aVOC compliant form release approved for all form liner materials.